Borgakh the Steel Heart is an Orc warrior and potential follower found in Mor Khazgur. During the day she can be found using the training dummy in front of Larak's Longhouse and at night sleeping inside. Although she is proud of Orc traditions and willing to abide by them, she seems uneasy about what her future may hold. 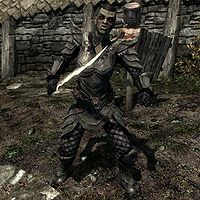 She wears heavy armor, including heavy boots and heavy gauntlets, and she keeps a set of ragged trousers for sleeping. She carries a sword and shield, a bow with 20 arrows, a key to the longhouse, and a selection of common items and gold. Her armor and weapons are leveled, and can be up to Orcish in quality. When in conversation and asked what she does for the stronghold, she will reply: "I am Larak's daughter. Soon, I'll be of age and will be sent to marry an Orc chief in some distant stronghold. Until then, I train. My new home will need strength, and my new sisters will know I'm not weak when I arrive." When asked about not knowing who she'll marry, Borgakh will say: "No. A chief's daughter marries who her chief wishes. It ensures the stronghold receives a fair trade in goods for my absence. I used to look forward to the day when I was of age, to see new places and people, but now it feels like a cage." You may ask her to come with you and she hesitantly responds: "I couldn't. It would shame my chief, and mother, and foremothers." However you may try to persuade her if your Speech skill is high enough. "You're right. Malacath teaches us to meet our fate. Perhaps this is mine." Another option is to offer to pay off her dowry, for a level-dependent sum. "That is a fine idea. The stronghold would need the gold when I am ready to marry anyway." If you are successful, she becomes a potential follower, as well as a candidate for marriage, and can be recruited into the Blades. In battle Borgakh seems to prefer using bows at range and doesn't seem to have any more than average health. If she becomes wounded and you use Healing Hands, she will remark: "Healing magic? An Orc lets her wounds heal naturally..."
Once she is following you, you can simply take back the gold you gave her for the dowry if you are in need of it. This page was last modified on 14 May 2013, at 01:36.